Antibodies are used in the diagnosis and monitoring of patients with various hematological diseases, in immunohistochemistry, and in flow cytometry (1-4). the internal structure (granularity) of the cell. Multiple fluorescent parameters may be analyzed simultaneously (1,5-7). A specimen of peripheral blood, bone marrow, or other cell suspension is incubated with fluorescent-labeled antibodies, which bind to target antigens on cell surfaces or—following cell permeabilization—to cytoplasmic and nuclear antigens. The labeled specimen then flows past laser beams, each of which excites a burst of light from a specific fluorescent label. The emitted light is captured by a camera, which records the occurrence of light emission (an "event"), its wavelength, and its intensity, a factor determined by the number of labeled antibodies bound to the target antigen. The antibody, the number of events, and the intensity of emitted light are recorded in the form of two-dimensional graphs or "dot plots" (also known as histograms). Examination of a series of dot plots permits cell enumeration and characterization, with the specific aim of identifying abnormal cell populations (1,6). The analysis of surface antigens is performed on cells selected (gated) based on light-scatter properties. Once the cells of interest are chosen, qualitative information may be obtained by measuring fluorescence intensity for each marker. 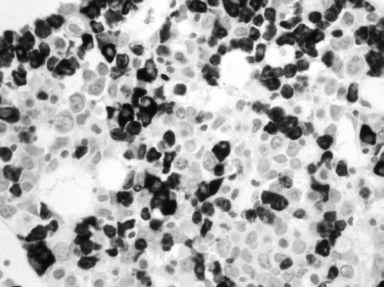 In the case of acute leukemia, leukemic blasts are assigned to B-lymphoid, T-lymphoid, or myeloid lineages. More rarely, leukemic blasts may be categorized as megakaryocytic precursors or erythroid precursors. MAb are used in six color combinations (all containing CD45) and analyzed using a technique that defines blasts by dim CD45 positivity and side scatter. The use of CD45 helps distinguish hematopoietic cells from nonhematopoietic cells (fibroblasts, epithelial, or endothelial cells) (8,9). In the case of chronic lymphocytic leukemia, common B-cell chronic lymphocytic leukemia (CD19+/CD5+) can be distinguished from T-cell proliferation. CD23 positivity and monoclonal expression of either K- or ^-light chains are phenotypic features that are characteristically distinguish clonal from nonclonal B-cells (9,10). Non-Hodgkin's lymphoma typically shows expression of CD20 and bright expression of monoclonal light chain. CD10 is often expressed in follicular lymphomas (9,10). The expression of a specific marker or the confirmation of markers defines a specific cell population or the original of these cells. This in turn helps in diagnosis and classification of various hematological diseases and leads to choosing a specific therapy. Here, we describe a methodology for using flow cytometry with six colors for the analysis of various tissues for hematological diseases. The methodology described here is for the Beckton-Dichinson FACS Canto, also with sample prep associated II (SPA).